Southampton and Newcastle go head to head at St Mary’s Stadium on Sunday, with the Saints aiming to reverse their poor goalscoring form in Premier League. Find here our Southampton vs Newcastle betting preview with predictions, betting tips, starting lineups, team news, odds, bookmakers offers and no deposit free bets on Sunday's matches! Southampton will be desperate to get back to winning ways after losing to Stoke in their last outing. Their home form this season has been poor to say the least, with Saints winning only one of four league match at St. Mary's this season - a 3-2 victory over West Ham that saw them labour past ten men with a last-gasp penalty. Also, the team failed to score in 3 of their 4 home games this season, if we include the 0-0 draw on matchday 1 with Swansea. The Saints have won just twice all season in the league, and one of those victories was against rock-bottom Crystal Palace. Matt Targett is sidelined for the hosts, but is Mauricio Pellegrino's only other injury issue. Shane Long has returned to training following a hip problem, and should lead the line in a 4-2-3-1 starting system, with Manolo Gabbiadini and Charlie Austin providing alternative options in attack. Dusan Tadic, Steven Davis and Nathan Redmond are expected to play in the advanced midfield positions with Mario Lemina and Oriol Romeu probable starters in the middle of the park. Maya Yoshida was rested after the last international break, but he was an unused substitute in Japan’s 3-3 draw with Haiti on Tuesday, so he may retain his start ahead of Wesley Hoedt in central defence. After starting the season on back-to-back defeats, Newcastle have spread their wings and slowed their drop. The Magpies defeated West Ham, Swansea and Stoke in consecutive games before poor finishing cost them in the 1-0 defeat at fellow promoted Brighton. Anyway, they dug in well to claim a 1-1 draw against Liverpool before the international break and sit 9th in the Premier League standings at the moment. Midfielders Matt Ritchie, Christian Atsu and Jonjo Shelvey are all expected to be fit, meaning that Paul Dummett and Massadio Haidara are the only injured players. As such, Benitez could name an unchanged XI with Ayoze Perez supporting Joselu upfront, Mikel Merino and Jonjo Shelvey in central midfield. Javier Manquillo was preferred to Chancel Mbemba at left-back in Gameweek 7, and could continue alongside Ciaran Clark, Jamaal Lascelles and DeAndre Yedlin in the back four. 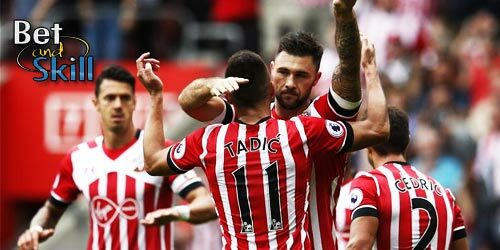 "Southampton vs Newcastle betting tips, predictions, lineups, odds and free bets (Premier League - 15.10.2017)"